Just thought I do a blog while I am relaxing after working very hard at a craft show at Glasgow SECC. Had a lovely time in Glasgow. Went late night shopping on Thursday, the town centre is huge. It is sooo pretty with fairy lights hanging everywhere, very romantic city. I have not had much time to blog the last few weeks due to the craft shows starting but hopefully this week I can catch up with the post I have missed. Tracy…. Our new designer. 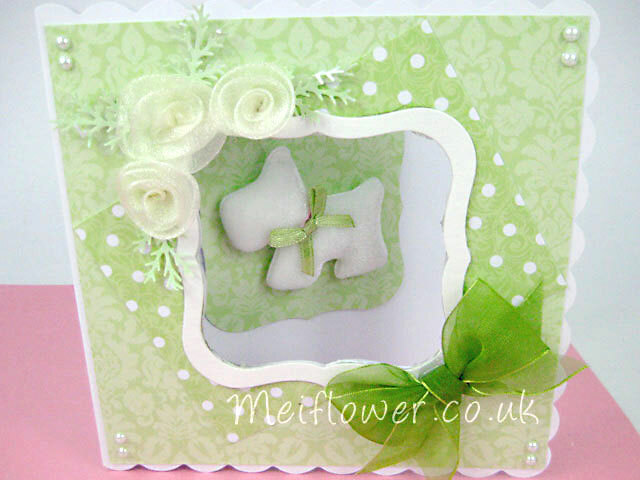 Has made some gorgeous cards using our Meiflower products. I love her style of cards, they are very different to mine. 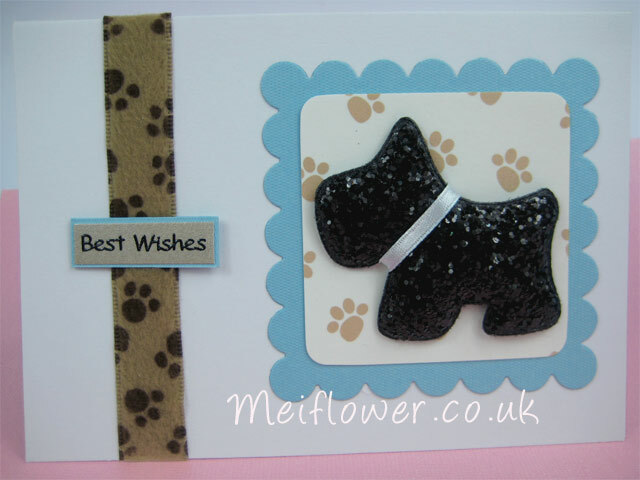 This is a card made using the white velvet scottie dog. It comes with a pink collar but Tracey has stuck a cute sage green ribbon bow on top of the collar to match the colour scheme of the backing paper. The paper used is from Kanban (love the colours). Sage green is very in vogue at the moment. I think the colours looks great on Birthday cards, Wedding stationery, Christmas cards. Gorgeous colour. 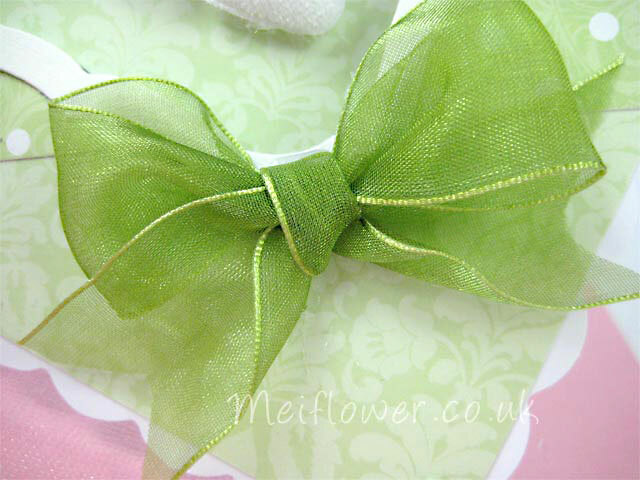 I love the way Tracey has used the sage green organza ribbon to create this gorgeous bow. Love it……Love it! Hope you have all had a nice relaxing weekend. This is the only weekend we have free now for a another few months, off to do the craft fairs around the country. It will be nice to meet our regulars again. I covered the front of the card with red and white gingham paper. 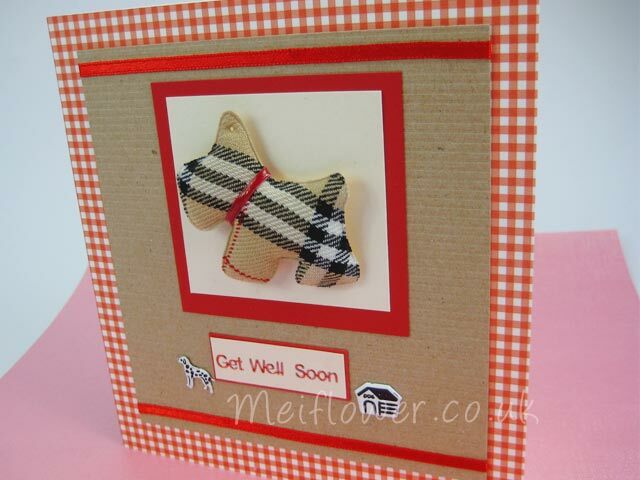 I used matching brown and off white card for this design to go with the tarten scottie dog. On the top and bottom part of the card I stuck a strip of thin red satin ribbon. 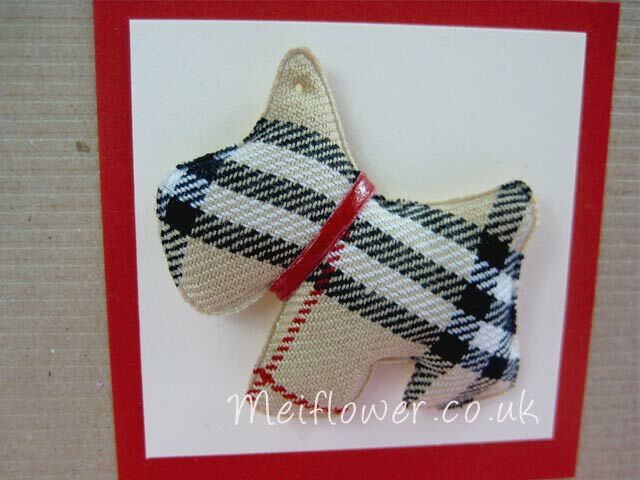 I have matted and layered the tarten dog onto off white card and layered onto dark red card. To finish off the card, I have stuck a kennel and a dog brad on either side of the sentiment. Here’s a video from create and craft where i made this card. Thank you all for your lovely comments for the blog candy. Sorry if your reply was late, we were doing a craft show at Manchester till Saturday and at a show at Stevenage on Sunday. It has been abit hectic trying to do my first blog candy. It took a while to do because I wanted to give away some nice yummy stuff. Hope the lucky person who wins enjoys the goodies. I wanted to share another doggy card with you all because someone at the craft show was commenting about how she would like to see more of my dog card designs on the blog. I love eating cupcakes, the backing papers looks so edible. The glitter dog looks really cute with the matching paper. I have used cerise polka dot ribbon and cerise organza ribbon to go with the design. On the corners of the frame I have stuck some pretty pink gems. 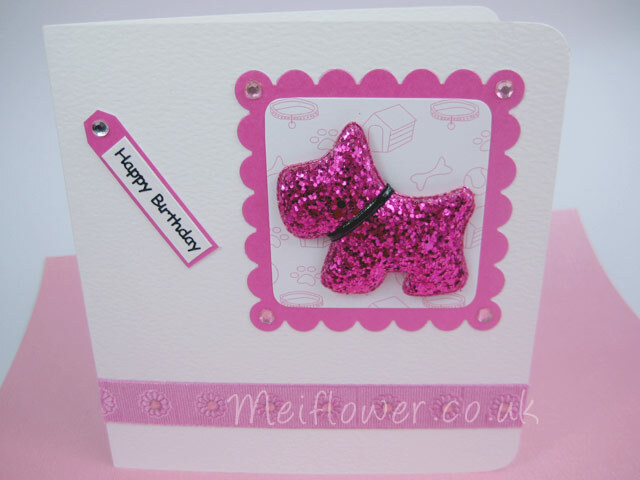 This is a card my friend Michelle Lancaster made using the pink glitter dog. 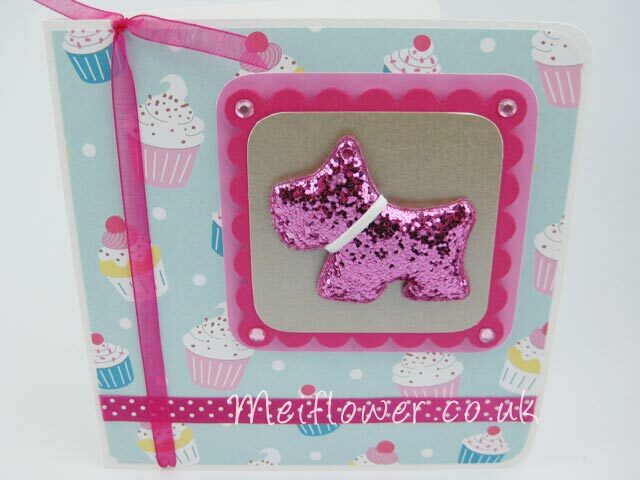 This is how she made it :- I made it with a glittery pink scottie dog, pink doggie ribbon and flower sequins topped with gems, all from my favourite on-line shop Meiflower. 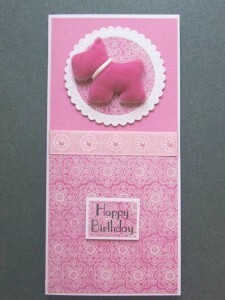 I have used docrafts pink textured card and polka dot paper from the polka dot pack from Wild Rose Studio. Woof . Bumped into my neighbour walking her dog today. Her daughters dog had puppies and she was showing me the cute pics. Awwwwwww, they are really adorable. I do like making dog cards even though I don’t own a dog. 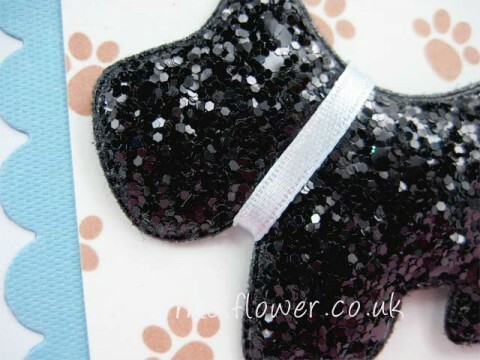 I just love using these sparkly glitter dogs, they just have a glamorous look to them. They are very popular with our customers at the craft show. The base card for this doggy card is a C6 white card. This is a quick card to make. I have cut the square scallop frame from a nestibilitie and layered with a square paw print patterned card, rounded the corners with a corner punch. The glitter dog comes with a fauz leather white collar. I changed the collar by wrapping a piece of light blue satin ribbon to match the cyan coloured card. 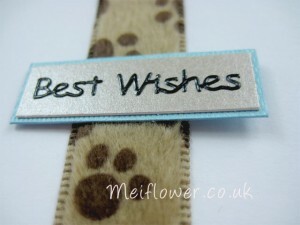 I have finished the card by sticking a piece of paw print ribbon down the left hand side of the greeting card. I have chosen a general sentiment black peel off and stuck the peel off onto a piece of light brown card, layered onto a piece of cyan coloured card. This is a card my friend Michelle Lancaster has made using the pink velvet dog and embossed flower grosgrain ribbon, thought I share her lovely deisgn with you. Michele has also supplied me with instructions. 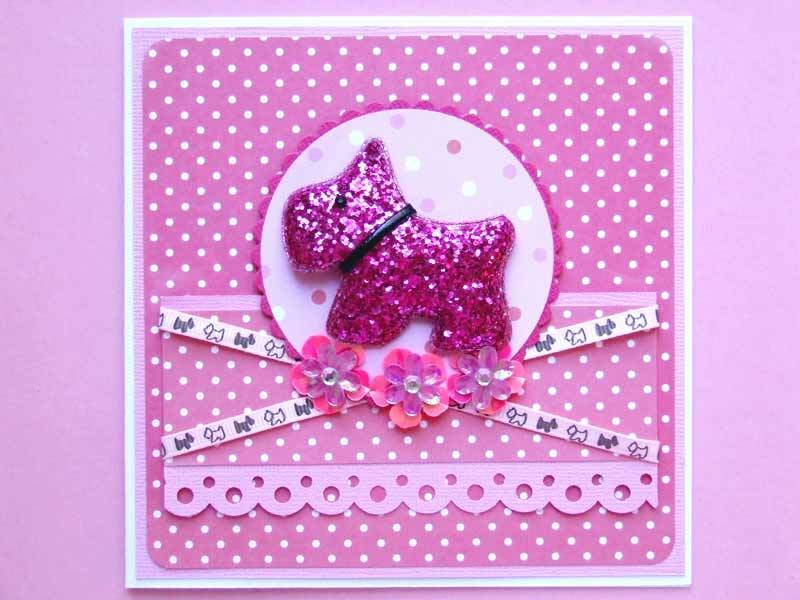 Pink Scottie Dog – The scottie dog has been mounted onto circle paper (MME) and scalloped card which I diecut with my cuttle bug. 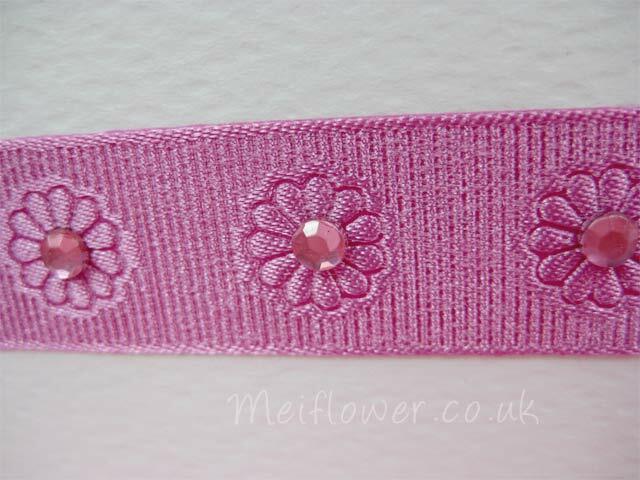 I have use MME backing paper, which has been mounted onto a section of Do Crafts pink card. 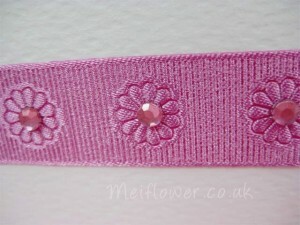 I used the pink floral embossed ribbon which I added little while pearls to their centres. 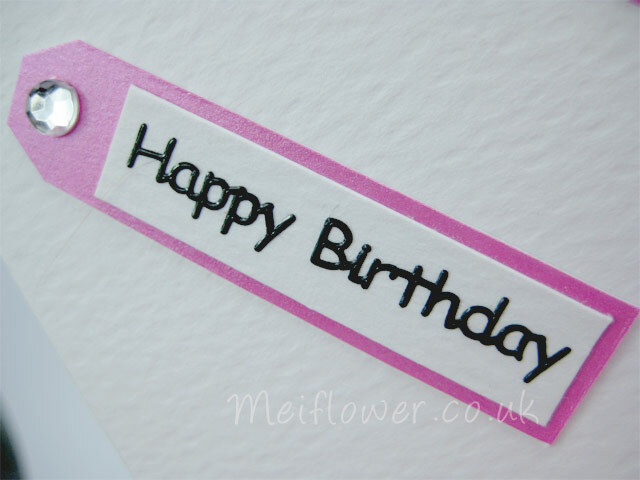 The card is finished with a stamped sentiment mounted onto white card. Hope are you all keeping well and ready for Christmas. Can’t believe it is only 4 days before Christmas! Went out today to do some food shopping and the traffic was horrendous, everybody looked soooo stressed out. It does not help when the roads are slushy and muddy from the snow. I like to share with you another cute doggy card. I seem to have dog cards in my head at the moment. I think it because every time i look out the window, someone is always walking past my house with a dog towards the park. The dogs look so excited in the snow, i feel sorry for the dog owners who try to keep the dogs under control without being dragged off their feet. You need a large white square 6 x 6″ for the basecard, round the righthand side corners with a large corner punch. This is a very simple card to make using the gorgeous pink glitter dog. 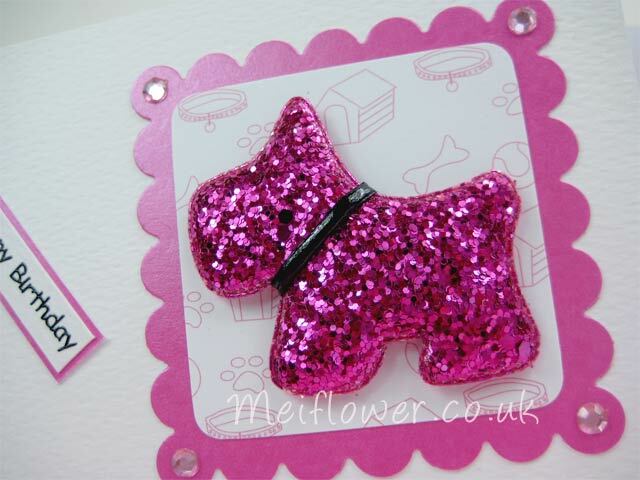 I think the glitter dog can be used on simple designs because of the texture of the glitter, it looks very glam. I have mounted the glitter dog onto a piece of cute patterned doggy paper from the payper box. The pattern consist off dog paw, dog kennels, dog collars, bones and balls. I have rounded the corners with a corner punch. Layered onto a matching pink square scalloped shaped card using a nestebilities, on the corners i have stuck matching pink self adhesive gems. On the bottom part of the card, I have stuck a strip of embossed flower grosgrain ribbon to match the framed glitter dog. To give the card abit more glitz, i have stuck pink self adhesive gems in the centre of the flower ribbon to give a extra special touch. I have finished off the card with a matching handmade tag. 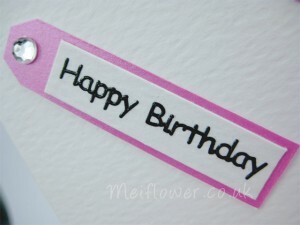 I have stuck a black ‘ Happy Birthday’ peel off onto a strip of white card, layered onto a strip of cerise card. Cut top corners at a angle to create a thin tag and finish off by sticking a clear self adshesive gem onto the tag to match the rest of the glitzy design.